When it comes to domestic surveillance, sometimes Congress seems like it’s expressing shock and outrage about something it already knows—or should have known. Take the use of drones on U.S. soil. FBI Director Robert Mueller admitted at a hearing this week that his agency uses unmanned aerial vehicles for surveillance on U.S. soil. Mueller insisted the FBI used drones “in a very, very minimal way”—but his comments did nothing to quiet the raging debate over privacy rights in the aftermath of National Security Agency spying revelations. Mueller didn’t help himself when, asked by Sen. Chuck Grassley, R-Iowa, whether the FBI had set limits on when drone use on U.S. soil is OK, he replied: “I will tell you that our footprint is very small. We have very few and have limited use, and we're exploring not only the use but also the necessary guidelines for that use.” It sounded like the drone equivalent of shooting first and then asking questions. But FBI use of drones on U.S. soil isn't exactly a state secret. The Associated Press noted in March that "last month, the FBI used drones to maintain continuous surveillance of a bunker in Alabama where a 5-year-old boy was being held hostage." And the use of drones for surveillance on U.S. soil is a well-reported phenomenon. How well? The Congressional Research Service (exactly what it sounds like) produced a 20-page report in April 2013 titled "Drones in Domestic Surveillance Operations: Fourth Amendment Implications and Legislative Responses" (the report was obtained and made public by the Federation of American Scientists). Within [the Department of Homeland Security], Customs and Border Protection’s (CBP’s) Office of Air and Marine (OAM) has flown missions to support federal and state agencies such as the Federal Bureau of Investigation (FBI), the Department of Defense (DOD), Immigration and Customs Enforcement (ICE), the U.S. Secret Service, and the Texas Rangers. And Congress has been funding those kinds of efforts since at least August 2010. That's when a border security bill allocated $32 million to give the authorities two new drones. The legislation cleared the House of Representatives by a voice vote and sailed through the Senate without opposition. In July 2012, the House Homeland Security Subcommittee on Oversight, Investigations and Management held a hearing titled "Using Unmanned Aerial Systems Within the Homeland: Security Game Changer?" Its chairman, Rep. Michael McCaul, R-Texas, wasn't shy about using his opening statement to describe the government's use of drones. 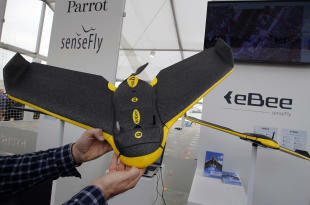 U.S. Customs and Border Protection began first looking at using drones back in 2004. Now, CBP owns ten UAS aircraft. These systems have been used to surveil drug smuggling tunnels; video dams, bridges, levees, and riverbeds at risk of flooding; and assist with the deployment of National Guard resources responding to local flooding. CBP has flown missions in support of the Border Patrol, Texas Rangers, U.S. Forest Service, FBI, and others. These systems have become a force multiplier for military operations and border security. None of this argues for complacency. Much of what the federal government has disclosed about its drone use we owe to dogged efforts by groups such as the Electronic Frontier Foundation, which has produced a peerless body of work on the issue—right down to a map of installations and institutions that have the green light to fly drones on U.S. soil. But when it comes to congressional oversight, voters might do well to remember the example of another authority figure who was "shocked, shocked" to find inappropriate behavior.